It's a great video eh? Did you spot Arlington House in the background? I'm sure I did! Also, was that the Margate pier that now no longer exists? Being just a young whipper snapper (!) I don't remember a pier in Margate but have seen many pictures of it before the big storm. Maybe I do remember the Prospect being painted pink, or I could be thinking of Brush Strokes! I didn't use the inn very much as it was a bit of a walk up the hill out of Minster so if I ventured out it was to the New Inn or the Bell at the bottom of the village. I am told that it was built in the 1930's and resembles the bridge of a ship although none of the ships that I served on looked like it. They did hold "singles nights" there at one time but I never went. It was painted pink at one time and looked like Elmo Putney`s wine bar from "Brush Strokes". Sorry that I can't really help you with anything else about it. 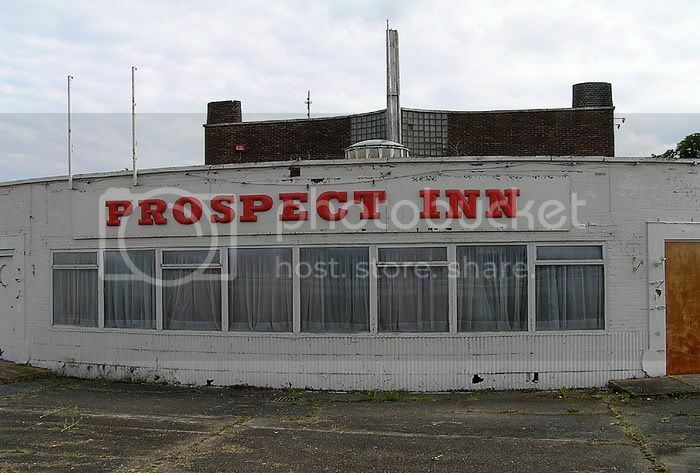 Another day off and a few more jobs around the house not done...I've been looking into the Prospect Inn at Monkton after a conversation with my nan. The inn was designed by Oliver Hill and 'I think' was often frequented by seasiders on Beano's to the Thanet coast. I remember seeing it on my jollies down to Margate & Broadstairs as a small child with my grandparents and may have possibly visited it, this would've been in the late 70's and very early 80's. I'm not sure when it closed down but after quite some time left in a derelict state it was aquired by the Holiday Inn group and has since been transformed into a hotel. My nan is sure it was once also a 'dinner and dance' venue, is anyone able to confirm this? Maybe Monkton Malc knows some history of the place as he's a local? I've been chatting to my nan about old Kent things and she's amazed about this site, so I'll be showing her a few things on here.